OMG!! My legs all over last weekend were in agony!! I nearly wet myself a few times because I couldn’t sit down. I honestly was not looking forward to my Personal Training (PT) on Monday, but I had to do it!! I wasn’t giving up!! I knew my muscles would be sore as my body isn’t used to the workout, and the PT’s confirmed this with me. I trained with Kieran on Monday, and I told him at the beginning about my legs, so he explained it’s probably the lactic acid build up and the best way to move it is to carry on exercising. We started on the exercise bikes to warm up. My legs were really sore but the longer I did it, the more they started to move. We did this for 5 mins starting at level 3 and then upping the level on the minute every minute keeping the rpm above 80. By the end of it, my legs had started to ease and I felt like I could move again. We then went onto hip thrusts. You lay on your back and then lift your hips all the way up, squeeze your bum together for a couple of second and come back down again. I did 3 sets at 1 minute each. I found these comfortable to do but could feel it in my bum after. We went on to squats. I done 4 sets, 12-15 reps. Not timing them but as many as I could as close to 12 reps. I went on to do 3 sets of clean and press (from the floor). Doing 10-15 reps each time. Again, this was pretty comfortable. Although at first it hurt my lower back, Kieran adjusted how I was standing and the next two sets felt fine. After this I done planks to crunches, one after the other. This was tough!! And hurt. But I surprised myself doing to plank. I done 3 sets aiming for 1 minute plank, straight into 5+ crunches. Due to it being one straight after the other, I could really feel the tightening in my stomach muscles. Kieran showed me the proper way to do a plank, and then showed me another version if I couldn’t hold it, so I would still be planking and not giving up. I did this a couple of times when my back started to hurt, but then got straight back into a plank. I literally pushed through the pain (which felt more like my muscles working than causing an injury), otherwise it’s so easy to say I can’t do it. We done body weight squats and goblet squats. 15 of each, 3 sets. Goblet squats are where you hold a dumbbell under your chin like a goblet, and squat. So you have added extra weight. They were comfortable to do, but as with any squats, your legs feel it!! Kieran showed me how to do rope pull downs. I done 2 sets of 12-15 reps. It took a few reps to start to feel the burn in my triceps. Next time I’ll have to use a bigger weight. For my cool down I done 3 minutes on the treadmill at a brisk walk. Feeling very hot and flustered by this point. We ended with stretches, and this really helped with my legs. By the end of our session, I was walking again normally. This weekend will be the only time my legs get like that, as they’re not used to the exercise I put them through last Friday, so there’s nothing to fear going forward with my PTs. On Wednesday I was back with Bella. Muscles were a bit sore from Mondays PT, but manageable. I started on the rowing machine for 2 minutes and then headed over to the spin bikes (my least favourite bike!!). I done 5 mins on the spin bike. 1 minute sitting, 30 seconds standing, keeping rpm above 90 each time. Sitting at level 3, standing at level 7. This alone feels like a workout!! I then went into the studio to do sprints to burpees (or thrust jumps). I had to run to one end, do 1 burpee, run to the other end, do 2 burpee, run back, do 3 burpees and so on up to 10. This was agonising!! And by about 5 burpees my legs were giving up on me, but Bella was very supportive and kept encouraging me to go. We then went into the gym where we done some boxing, followed by 10 press ups straight after, and then 10 military presses straight after again. I could really feel it all over. We done 3 sets of this. I enjoy doing the boxing as It relieves a lot of tension in your body. I can’t hit very hard though!! This was a lot of upper body so my arms were quite tired after this. We headed back into the studio where I done 3 sets of squats for 15 reps then straight into mountain climbers for 10 reps. I hate mountain climbers!! I can’t do them and they hurt. You put your hands on the floor and basically run on the spot, bringing your knee up to your chin as fast as you can. I hate them!! We ended on the running machine. I explained to Bella that I have a genuine fear of the running machine. I get claustrophobic when I get breathless and then start to panic. Bella listened and modified it slightly. So instated at a brisk walk on level 5 for 2 minutes, I then done a 20 second sprint on level 9 (or which every felt comfortable to me), back to a brisk walk for 1 minute, back to a sprint for 20 second… We done this 4 times. I didn’t get to0 breathless and had my breathing under control so was happy doing this. Today I trained with Jonny. We started by doing a 5 minute warm up on the cross trainer. 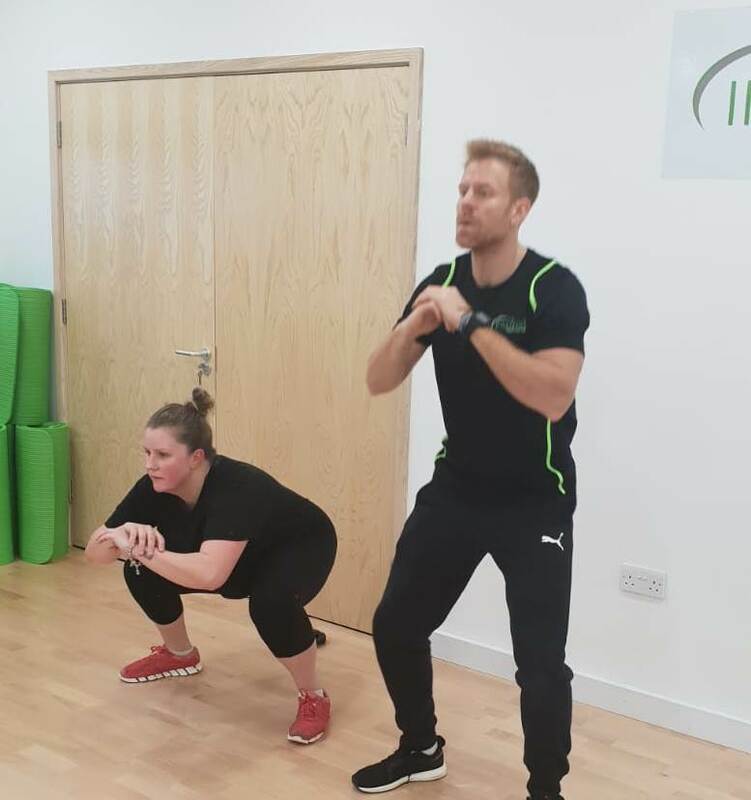 Jonny’s PT session was all about circuits but he knew a great way to switch it up and it was a lot of fun!! So, what we did was write down numbers 0 – 9, and next to each number a set exercise. We then picked my mobile number and carried out the exercises, as per the number one straight after the other, in each set. It kept me focused as I didn’t always know which exercise was going next as I was focusing on the one I’m doing. He wrote the exercise linked to each number on a white board for quick reference. Unfortunately my mobile has a lot of the same number so I had to do double of a few. We ended up using my mobile number, Jonnys mobile number, my DOB, my eldest son’s DOB and my brothers mobile. It was honestly a lot of fun and really mixed it up. It was also very hard as some numbers kept coming up one after the other. This PT was really enjoyable and the fun behind it helped immensely. Jonny is also a brilliant PT, really encouraging me, also doing some of the sets with me to spur me on. We ended by going on the cross trainer again at level 6 speed 6, stretching out after. There’s a lot of stereotypes out there, where females feel intimidated by male PTs, but honestly I can’t fault Kieran or Jonny. I’d recommend them to anyone, male or female!! They work to your ability, the same as a female PT would!! Again, if you’re on Instagram, then please follow me @slimming_with_kelsie_sw as I add to my feed daily about what I eat, and what exercise I am doing. If you see me around the gym, feel free to come and have a chat or ask what I’ve been up to with the team! !